When I saw the charming and disarming Wave Pictures in Bexhill last summer, they had finished recording their most recent album, at Billy Childish’s studio in Kent, only a few days earlier. Just one of the songs that lead vocalist and guitarist David Tattersall co-wrote with Childish for the album was played that night but, a year on, and with the album released earlier this year to critical acclaim, a trio of those tracks formed the centrepiece of their set at the Underground Theatre in Eastbourne last night. Working with Childish has given the band’s songs a garage rock edge and, having played the provocative and raucous Pea Green Coat – “Everybody in the station wore black/And then there was you in your pea green coat” – requests from the crowd for The Fire Alarm are rebuffed with typically self-deprecating humour. 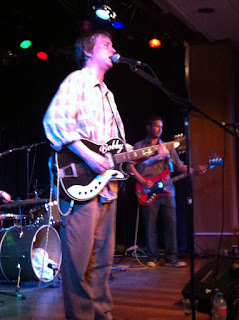 “We can’t play those two back-to-back,” Tattersall explains, “because then you’ll realise they are the same tune - essentially, we only have about three songs.” None of which is true, but they launch into the album’s title track, instead, before completing the run of songs from Great Big Flamingo Burning Moon with The Fire Alarm, safely distanced from its ‘doppelganger’. As well as the flamingo, other avian life is present: from 2012’s delicious Long Black Cars album, both Stay Here And Take Care Of The Chickens and Seagulls are performed; and The Wave Pictures’ recurring motif of the sea features on Blue Harbour, from Beer In The Breakers, with the wonderful lyric, “let my eyes slip away/ toward the coast around the pier/ all the things that brought me here”. Bassist Franic Rozycki’s phrasing in the song’s run-out is also a delight. Drummer Johnny Helm demonstrates the power of his voice when takes the vocals on Atlanta, from 2013’s City Forgiveness, and again later in the set when they play an old song, Sleepy Eye, from 2005’s Hawaiian Open Mic Night album. We are offered the democratic choice of Helm singing that or Now You Are Pregnant, another old song, but the crowd opt for the former. Then there is more audience participation as we are given the tricky task of singing the chorus to Come On Daniel (“come on Daniel!”), and Daniel-time is completed with the obligatory Daniel Johnston cover, this time, I Killed The Monster. Jointly promoted by excellent local record stores, Bexhill’s Music’s Not Dead and Eastbourne’s Pebble Records, this superlative gig is brought to a close with two numbers from City Forgiveness: the final song of the set is Lisbon, with lyrics - “It was one of those days/ the dead were digging upwards through the earth” - that perfectly demonstrate Tattersall’s gift for marrying the prosaic and the absurd; and the encore is The Woods, a frantic Velvets-style workout that crackles with intimate electricity. There is only a month to go until the Green Man Festival where I will see The Wave Pictures again. But I can barely wait.